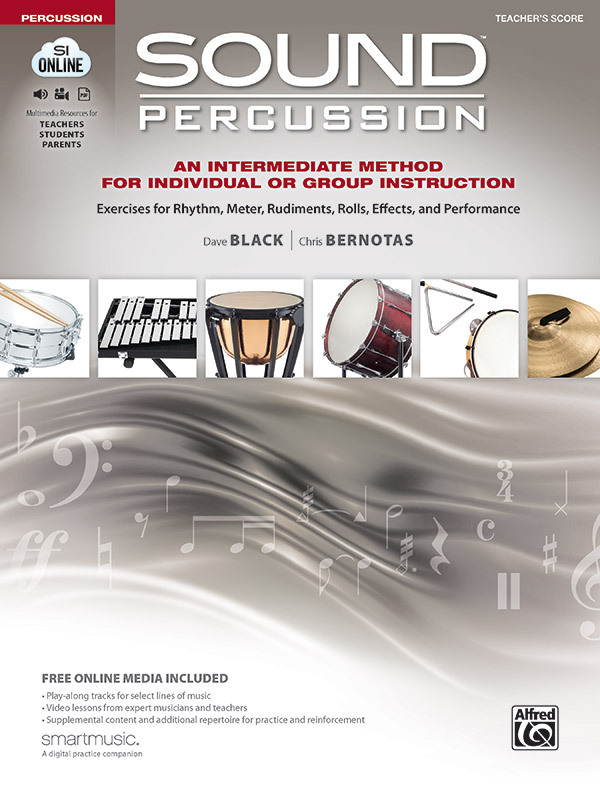 Written by Dave Black and Chris Bernotas, the authors’ passion for education and a deep belief in the importance of music for students of all ages is at the heart of Sound Percussion. Depending on the specific educational objective of each lesson and the needs of the students, directors can work through the book(s) progressively or jump from section to section. Use it as you see fit! Because you’ll now have all the tools needed to help prepare students for any challenge they may face musically, Sound Percussion will give you, the director, a renewed sense of confidence to foster student understanding, growth, development, precision, performance, and excitement as they work towards becoming well-rounded percussionists. Create better understanding with solid pedagogy, and a clean and uncluttered page layout. The Teacher's Score includes all of the information found in each student book and serves as a complete resource for percussion instruction. Perfect for non-percussion specialists, this is the solution with answers to all your percussion-specific questions and “how-to’s” of technique. SmartMusic connects you and your students through the web. Send assignments to your students using the material in Sound Percussion. Students receive immediate feedback as they practice each assignment, and the best performances are sent back to you to provide assessment. SmartMusic also provides students with vital practice tools, including a tuner and metronome. Sound Advice sections throughout the book include invaluable tips and suggestions to help ensure understanding, as well as to provide reminders about important concepts. The material is organized into six sections to provide intermediate goals, benchmarks, and opportunities for assessment. All students are involved in every exercise. No longer will students watch ONE player practice timpani, as they will all get to rehearse. The Appendix features additional helpful hints for the director, including strategies for keeping students involved in rehearsals. The Teacher's Score includes information and step-by-step instructions for tuning and changing heads, as well as other instrument maintenance that may be required.